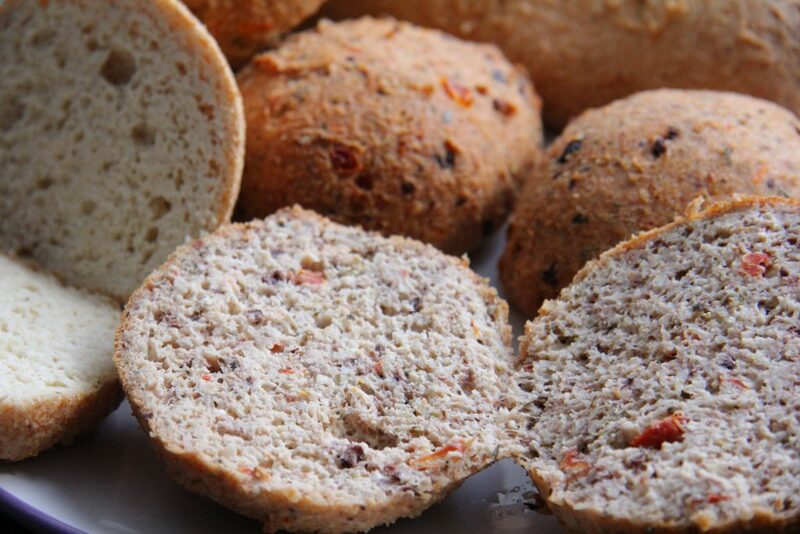 This low carb and gluten free almond flour bread roll recipe is one of the best alternative to bread I have ever tasted. It looks like dough when you are making it, smells like bread, and looks like bread with air pockets BUT…*drum roll*…is gluten free, grain free, low carb and just fabulous! I think you could get away with passing these off as bread and no one would know. They rise like bread…oh the excitement in my kitchen at the moment as I am whipping up a batch every other day. I feel like running out into the street and handing rolls out to spread the word about this healthier alternative. So if you see a crazy lady on the corner handing out bread rolls, don’t be afraid and cross over the street, take a couple! I’ve started playing around with the flavours too, added chopped up sun-dried tomatoes and olives in one batch. Nice enough, but I still prefer the plain ones. Will try adding some dried onion to the next batch. Another great thing about this recipe is that it is very easy to make, and compared to the traditional bread method of kneading and rising, you wonder why people bother. Just make lots of these! This recipe is based on the one by Maria Emmerich and the original recipe can be found here: http://mariamindbodyhealth.com/toasted-sub-sandwich-and-panini/. A key ingredient to making this dough-like mixture is psyllium husk power (it MUST be the powder) which seems to act as the binding ingredient. Psyllium husk is a great ingredient for intestinal health. It contains a spongy fibre that reduces appetite, improved digestion and cleanses the system. It is high in fibre too. Just make sure you drink plenty of water. I purchased my psyllium powder online, but your health food shop may sell it too. It does vary between brands and some can yield a different colour in the bread roll. As well as rolls, you could mould this into a bread tin and have a loaf of tasty bread. I made a small loaf and had toast with my scrambled eggs for breakfast. Tears of joy added some salty taste that morning 😉 My cupboards are now groaning with almond flour and psyllium powder! And I am having rolls for lunch! Bring on the soup, as I have bread to soak it up too!! Don’t waste the egg yolks, make a batch of home made mayonnaise to put into your rolls for lunch! Place the almond flour, baking powder, psyllium husk powder, flax-seed flour and salt in a bowl and mix thoroughly. Add the olive oil and eggs and blend well until the mixture looks like breadcrumbs. Add the apple cider vinegar and mix well. Gently add the water, a bit at time and stir into the mixture (you may not need it all if it looks too wet). Let the mixture stand for 30 minutes to firm up. Using your hands, make a ball of the dough (I find keeping my hands wet helps with the sticky dough). Place the balls on a parchment paper lined baking tray. Bake for 30 minutes until golden and firm. I also get a little teary-eyed with joy when I think about my first bite into these little rolls of delight. I cannot thank you enough, I’ve shared this with friends who need it and I’m sure I’ll be hearing back from them soon. I have my second batch in the oven now, the first batch lasted one day but I’ve noticed a distinct improvement in my Candida symptoms. I can’t thank you enough, the psyllium powder is such an excellent addition. I felt the same way about these the very first time. They are great to play around with too. Once you go psyllium husk powder for bread..you can’t go back! Glad you liked them too! I was wondering, do you have a link to your old recipe? I like this one, but found it tastes more like a biscuit, where your other recipe tasted more like a roll. I’d love to have links for both! I think the rolls were very good! I will be making them again! Just wondering if you can use yeast in this recipe if you make the water warm instead of hot? I’ve not tried that but can’t see why not. Amazing recipe! I’m a newbie in keto, delicious and easy to make. I got mine rolls perfect first time doing it! Thank you! Thanks! Glad you enjoyed them! I was ready to give up on finding a good low carb bread recipe. This one is really amazing. I love them and my picky husband loves them too. Thank you so much for posting this recipe, they are absolutely delicious! Just took these out of the oven and they smell DIVINE! It’s all I can do to keep from swiping a hot roll off the tray and dinner is still hours away. I made 8 smaller rolls thinking I would cut a few calories but when I put the recipe into SparkPeople’s calculator it actually came out to 328 calories for one of 8 rolls. How did you calculate the nutritional info? I am having a half with dinner regardless! YAY BREAD!!! Hope they taste as amazing as they smell! They are great aren’t they? I use a nutritional tool for all my recipes. It’s one that was recommended to me when I took a nutritional course. 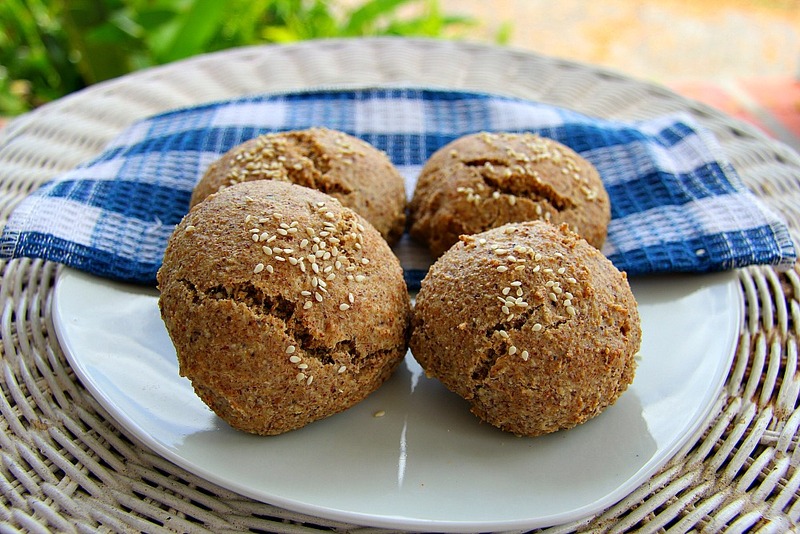 Hello I am Sophia from greece thank you sooooooo much for this recipe.i tried many recipres so far but yours its the best best low-carb gluten-free bread recipe ever! I made these many times and they are perfect!!! Hello! Glad you enjoy them! Can’t wait to try this! Have you tried freezing the leftover rolls? I don’t eat bread very often, but occasionally have healthy homemade burgers. My current GF bun recipe is not working for me though! Yes they freeze well. Hope you enjoy the recipe. Hi! These are a staple I’m my house! (I am currently using your most updated tweaks) this Christmas I made a traditional German Christmas Stollen using dried fruits & almonds by using this as a base… I wish I could send you a picture, it was amazing! Even my toddlers loved it! I’ve toyed with the idea of making these in a loaf pan… Do you think it would ever work? Or would it be too under cooked in the middle? Wow! Love the idea of a stollen. Ou should make another just for the photo!! I’ve made this in a small bread loaf and it worked. I did need to bake it a bit longer though. Thanks for popping by and wishing you and your family a wonderful 2017! Hi Angela… This recipe has become our very favorite LCGF rolls. I love how fast it is to whip up a recipe. I have tweaked the recipe with coconut flour using just 2 whole eggs and it is still really good. Just wanted to pass along a tip… I wanted to take some hot dog rolls made from this recipe to a pot luck (so we did not have to eat the white bread rolls), and added 2 heaping tsp Hot/Sweet Mustard to the recipe, and the taste was wonderful with the hotdogs. I still add a little mustard to the recipe most times…just 1 tsp, and it gives the rolls a nice flavor kick. Love your blog. Thanks for all the inspiration!! Hi Linda! Glad you are enjoying the blog and thanks for the tip on the mustard addition! Sharing is caring! Hi! I made these last night and they are the first GF roll that tasted great! I was impressed with the crumb texture, very similar to wheat bread. They were just a bit bland, so could I add a bit of sugar without compromising the recipe? Also, have you used these to make stuffing by chance? Thank you! How about some herbs or garlic/onion powder to add flavour to them. I’ve used them as breadcrumbs so they should be good for stuffing too. OMG after about 13 batches and following all your tips and suggestions, I finally figured out the issue. I can’t believe I didn’t think to tweek that aspect until now. 1/2 cup of coconut flower was TOO much! Perhaps it’s the brand of coconut flower that I have, but reducing it just a bit was magic. The entire consistency changed and I finally have something that looks like a roll on the inside. They fell when using 2tsp of baking powder but at 11/2 it was fine. I also use only 2/3 cup boiling water. After cooking them, I do need to turn the oven off and leave them in there about an hour or they are still wet inside, but FINALLY progress 🙂 So if anyone else out there can’t figure out why it’s not working, try a little less than 1/2 cup coconut flour in your measuring cup, and do not pack it in. Can’t wait to try it in a loaf form now. I am delighted that it finally worked for you!! Thanks for the tip too!! I just found this recipe, and it is a keeper! I cut a couple of the rolls up and made croutons. That gave me another idea: fake bagel chips. I flattened the rolls slightly before baking. When they were done, I split the rolls, basted the tops with garlic butter/olive oil, then cooked them in a 325 degree oven for 20 or more minutes until they were somewhat crisp. They will get crisper after they cool. These are great for dips or bruschetta. They were even better on the third day. Gail, that is a great idea! I’ve been thinking of doing bagel chips with my bagel recipe but was not convinced it would work. This sounds much better! Would you like this to be a featured reader recipe on my site? If so, email me the recipe and a couple of pictures and I’ll put it up to share with everyone! First time they were nearly perfect. But now as i make them, the air holes are to big. They seem to rise too much. Any tips? Hi Rosi. Glad they worked out for you. Perhaps you overwork the mixture when you add the water? Used 3 Flax Egg rather than real eggs. Turned out perfect! I’m very impressed with this recipe! Ooh! Thanks Nancy! That’s a great tip for anyone who is allergic to eggs! And for making these vegan! Hi Angela… Just found your site a couple days ago, and enjoying what you are doing!! So, I have spent the last two days making different versions. The first rolls came out perfectly, and like many comments here, the taste is really nice compared to other GF and Low Carb breads I have tried. I baked the rolls like the recipe says – 55 minutes, and the internal temperature (with insta read thermometer) was 200. I read somewhere that it was important to get the temp at least to 200, so that might help some folks who are having trouble with their oven temps. They did not rise as much as the picture, but were great as is, and even better sliced and toasted. I have Americas Test Kitchen cookbook – The How Can it be Gluten Free cookbook, and they have some interesting insights into gluten free that I did not know. Gluten Free “flours” do not absorb fat like regular flours, and I think that is one of the nice things about your rolls… They are not greasy like so many things I have tried to make. And the ATK cookbook uses the phyllium instead of xanthum gum. Unfortunately, their gluten free flour mix is all starch, and made my blood sugar go through the roof. Back to the roll recipe… I put another batch in a 3.5×6″ pan and baked for 1hr 30 min, til the internal temp (at the top of the pan) was 211, but when I cut into it after cooling, the top part (that had raised so nicely above the pan) was perfect, but the part completely inside the pan as it cooked was still wet and dense. I have the slices in my dehydrator right now to see if I can get some of the moisture out. The dehydrator has helped me with other flatbreads, to make even crackers out of them, if I let them go long enough. So onward with experimenting! My husband is enjoying it all!! Thanks and have a great holiday! Hi Linda! Glad you found me and hope you had a fabulous holiday! Love your experimentation too!! Hi, writing from the Netherlands. I’m planning on trying to bake them soon. I was wondering of you can freeze the buns? Hi! *waves across the ocean* Yes, you can freeze them. Happy baking and thanks for stopping by! I made them today. They are wonderful! Really delicious. That is strange as I was thinking about french bread yesterday and wondering whether a gluten free version could be created! I haven’t come across one yet but am on the search! Hi looks amazing! However very difficult to get psyllium powder/husks here in Zimbabwe, Africa! Is there any other alternative you can suggest? Thanks soooo much! Hello Zimbabwe! A place I’d love to visit! Perhaps try ground flaxseed? Happy baking! Ground flaxseed works in place of the psyllium powder? Equal portions? I’d add an extra tablespoon of the ground flaxseed. If you can get the laxative Metamucil in a pharmacy, unflavored not the orange flavored, it is basically ground psyllium. Try that. Thanks for this recipe. Made them this morning to have for lunch (salmon cucumber rolls with kale, beetroot and candied walnut salad). The rolls were fantastic!!! Even the man loved it. I put a dash of sesame seed on top of each before baking and they came out looking very professional. Waited until needed them before cutting. Very light and delicious can’t believe how easy it was too. Will definitely make again. Huzzah! Happy baking in Australia! I’ve tried this recipe 3 times now and I still get a slimy wet texture inside. I’m using coconut flour and liquid egg whites. One thing I’ve noticed is that when I add the egg whites and vinegar to the dry ingredients there isn’t enough liquid to mix it all together. So forget about whisking anything. Adding the water does mix the ingredients, but something is wrong. I’ve tried it by hand and I’ve tried it with my dough blade in my food processor. Same result. Third time I used less baking powder and I got the buns to rise, and stay risen once cooled, but they were hollow at the top and still wet and slimy inside on the bottom. Please help!! I’m puzzled Renee. Sometimes a different brand of pysllium powder can change the recipe. Have you looked at the video that is on the original site (link is at the top of the recipe)…that might help? I have watched the video. I don’t have a hand mixer or scale (maybe my coconut flour is a different weight?). I’m going to try to get both and see if that helps. But my dough looks similar, but still wet and slimy inside. Should I turn the oven temperature up or down a bit? If all that fails I will try a different powder brand. Hi. Perhaps turn up the oven a bit. I made a batch of these yesterday with a brand of coconut flour I had not used and they turned out okay. Let me know how your next batch goes! So I realized my baking powder was ancient. Grabbed a new box and tried again. Baked at 350 for 55 mins, but we’re still wet inside and slimy. Turned the oven off and left them in there ( for an hour, since I forgot). They were better but still dense and slimy. They also still sank a bit after rising. Will try again on higher heat. Maybe I’m using too much egg white? I’m using the conversion on the box of liquid egg white, 2tbsp is 1 large egg white. Also, I’ve been using the egg whites cold. Could that be it? Aha, sounds as if you are using a bit too much egg white. Reduce this and the water. So I would have been using 180ml of liquid egg white to get 6 egg whites. Do you know roughly how much you use when it is from fresh eggs? Not sure to be honest. Perhaps reduce the mixture to the equivalent on one egg? Shame you are not local to me as I’d say pop by the kitchen for a quick baking afternoon! That’s a kind offer!! I’m actually very good in the kitchen believe it or not lol, just can’t conquer this one! I have faith the next batch will be beautiful!! Fingers crossed! We all have our bad days in kitchen! (I had an awful one yesterday..nothing worked all day!). Happy baking! Hi Renee. Sorry to hear about this. I’m at a loss. Have you looked at the postings on the original Maria recipe to see if anyone is having the same problem? It’s very strange they aren’t rising. Wish you lived nearby so you could pop by for a baking experiment! Maybe try using the white from an actual egg..? Just a thought; I never use the carton egg whites..
Hi, I want to try this recipe but may I have the ingredients in grams instead of cup or could you tell me if you use UK Cup or US Cup? I’ve been reading the discussion between Renee and you and noticed she was using liquid egg whites but no eggs. Maybe it needs the yolks from the eggs that are in the original recipe? Just a thought. Hi I just tried your recipe for the first time, but it was a disaster:( it wouldn’t firm up into a dough. Could it be that the egg whites were too cold because i used it from the fridge or my psyllium husk was too rough. Perhaps it is the psyllium husk as it needs to be in a powdered form? Hi there, I tried this yesterday. Couldn’t get any psyllium husk powder (Holland and Barrett only stock the capsules) and so instead I emptied out enough of the capsules to get 5 tbsp. of the psyllium husk powder. The rolls rose beautifully and perfectly cooked but they are a bit gritty almost like there is some sand in it. Is this expected or might it be cos I used the powder from the capsules? Hi! probably. Perhaps put the powder from the capsules into a coffee grinder to make them smoother? Glad it rose though! Happy baking. I’m not in the US, so I’m not familiar with the cup measurement for the almond flour. Can you please tell me how many grams or oz are needed for a ‘cup’? http://dish.allrecipes.com/cup-to-gram-conversions/ states that 1 cup ‘bread flour’ is 136 g / 4.8 oz but I don’t know if that’s the same for almond flour. Hi Bob, 1 cup of almond flour is 96g. Thanks for contacting me about this as it’s something I’ve recently considered doing! The science in this recipe worked perfect! I wish I could post pics! Best GF bread I have ever made or eaten. I followed the coconut flour recipe. On a side note, I would mention that these rolls are very sensitive. They need to be gently removed from the oven and then left to rest without disturbance, otherwise, they will collapse on you and you wont get to experience the glory of these beautiful works of art. Also, the mention made about not eating them while warm is absolutely correct, they got better the longer they sat out. Amazing! sorry forgot to tell you, they did not rise at all, they were flat and runny, with no life. 12 egg white for coconut flour recipe, yet when it came to the water i put 8 cups of boiling water the mixture seemed really runny????. Hi John…ermmm…8 cups of boiling water? The recipe usually use just under a cup of water (it has the amount as a fraction..I should perhaps change that ). So it would have been under 2 cups of water for doubling the recipe. Hopefully you try it again and are more successful! Let me know how the next batch goes! Can I ask how did you get the nutritional facts for this bread? I recently purchased the Paleo Bread from Julian Bakery and their ingredients are identical to yours, however, they claim to have a lot less calories, fat, carb, protein, etc. Hi Engrid. The nutritional information is as per Maria’s original recipe on this link http://mariamindbodyhealth.com/toasted-sub-sandwich-and-panini/. Also, is it the same quantity of each ingredient? Is the weight of each serving identical? My last two loaves have not risen and were thick and dense but tasted okay. I used frozen egg whites which I defrosted before baking. Could this be the cause of the problem? I use coconut flour to make the bread. Hi Kailas, yes that does seem to be the problem. I’d use fresh white eggs. Hope your next batch are okay! Hi Jo, I don’t think that it would work quite as well as you need to whisk the mixture and the egg whites give it a bit of lift. However, I’ve never tried it, but would guess it would yield a denser bread. Hope you enjoy the recipe and thanks for popping by! Please advise a reputable place to buy psyllium husk powder. When I google it online or read the reviews at Amazon there seem to be a lot of complaints about quality and they discourage use of the powder. Hi Tim, I use Amazon and am also currently lucky enough to purchase it from a local pharmacy. The brand I often purchase from Amazon is from Whole Foods online. Just made these and they turned out well. However, whenever I use psyllium powder, I get a gritty taste, almost as though there is a bit of ground glass in it. Is this normal? Could it be my brand of psyllium? Hi Linda, it will be the brand of psyllium…it’s amazing how many brands can give different results. 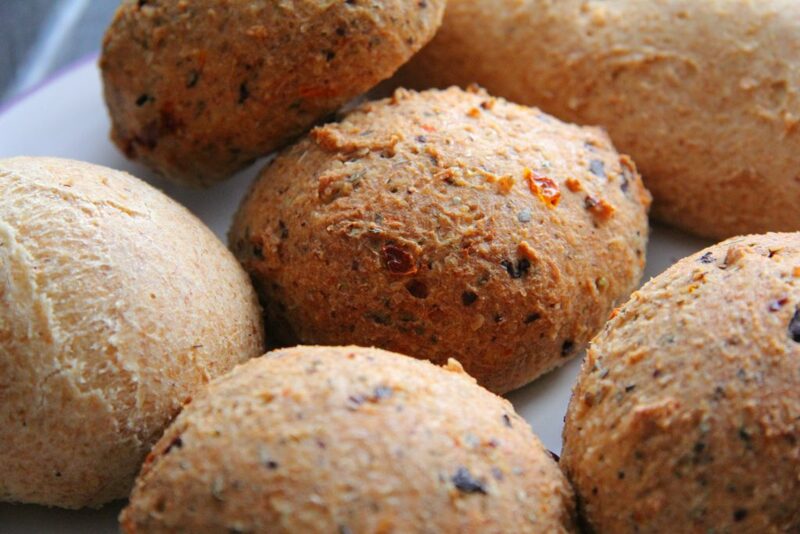 The gritty taste is not normal – are you using ground psyllium? Glad you enjoyed them and thanks for popping by! Can you replace the white eggs with chia seeds? Have you ever tried? Hi, I’ve never tried that but in theory it could be done. They look great! I will try them.Have you tryed refrigerating them and warming them up next day?I want to have them for breakfast, but don t want to cook in the morning time:)Thank you! Hi Rebi, yes I have. I make a batch, keep them in a fridge and them toast them the next day for breakfast. They will keep in the fridge for about 3 days. Hope you enjoy them! Thanks for popping by! You and your recipe are awesome!!! thank you so much 🙂 I am on my second batch and just added 1/3 cup pumpkin and some cinnamon, they are in the oven now but I am sure they will be awesome! Awwh, thank you so much! I am so glad you enjoy it! And am just loving the idea of adding the pumpkin and cinnamon…genius!! Just come across this. Has anyone tried making and freezing? Would it be okay defrosted? Hi have tried this recipe again and still not good! I purchased a second batch of Psyllium husk powder and yet again the bread has gone purple. As this powder is not cheap I do not feel like risking another purchase as already I have two packs that I do not know what can be used for. I would appreciate any feedback! Apart from the purple, what is the texture of the bread? You could make flat bread with the remaining powder too.. Does anyone else have the same problems as Barbara? The texture is very dense and not edible. Do you have to kneed the Dough? The dough does not require to be kneeded. Once you have added the boiling water to the mixture, stir/whisk well (I use a hand whisker), then mould into your rolls. Bake immediately. The mixture must not be overworked too much. It’s almost the opposite of making traditional bread! I made the bread and it came out great. I did powder the husk in the coffee grinder, as I did not want to buy it, and already had some at home. Barbara, I would say return it, it could be something in that brand, and try a different brand. Or get psyllum husk and grind it at home, not hard to do. Hi Daisy, so glad you enjoyed the recipe! Thanks for popping by! I made this recipe twice with coconut flour and wow, I was impressed both times. This gluten free bread tastes like the real thing. I can’t get enough of it. I love your website!! Thanks Mark! Glad you enjoyed the recipe and the site! Thanks for popping by! First attempt at these today was a disaster, they looked like rolls until I cut into them. They were hollow at the top and stodgy at the base, the mixture was quite wet and it didn’t hold it’s shape on the baking tray, then rose really well. I am in the uk so not sure if my ingredients were quite right, the psyllium husk powder looked like ground husks rather than a true powder. Any advice would be helpful, your picture looked fantastic! Hi just about to bake these but are Ground Almonds the same as the flour? Hi Barbara, yes they are here. 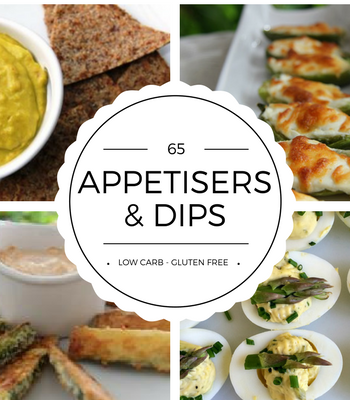 Hi–My husband now needs to be on a low to no carb diet, but loves bread. 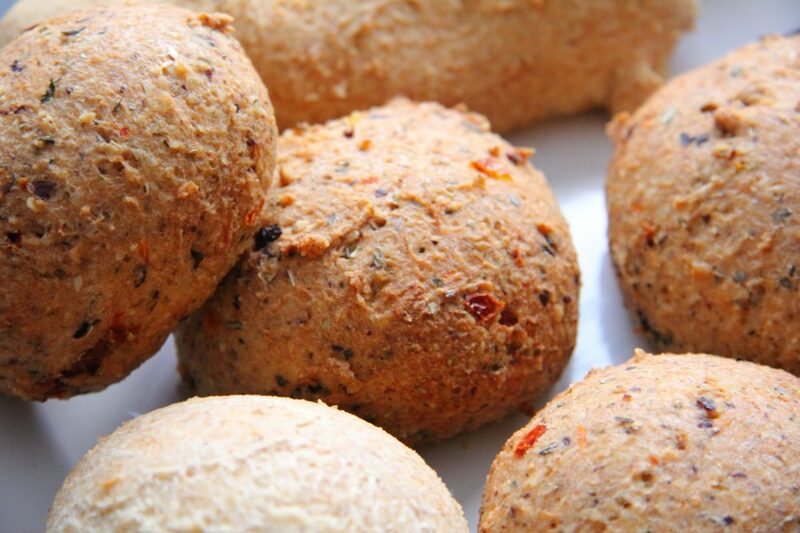 I would like to try this Amazing Bread Rolls recipe BUT I am horribly allergic to psyllium powder. What can I substitute as the binder? Would oat fiber work? Any help you can give me would be very appreciated!! I am not sure that other binders would work as well, but no harm in trying. Oat fiber may work? Or perhaps chia seed, flax seed, organic oat bran. If anything does work, let me know! Hi can you tell me whether the alternatives to pysllium have been tried and tested by anyone? I tried your recipe and poured the dough into a small loaf pan and baked for 1hour and 20 minutes. While it looked perfect on the outside (and smelled divine!) the inside was “slimy” and looked like uncooked egg whites, any idea why it would do that? Should I try less water or less egg whites? Also, when you double the recipe to make a loaf, how big is your loaf pan and how long do you bake it for? Thanks for your help! What a shame! ‘ve had that problem occasionally too..I wonder if it’s the temperature of the oven too…perhaps turn up the heat a little bit more (I swear ovens vary from each other when it comes to heat). I would perhaps reduce the water and cook it for about 1 and a half hours. Test it with a toothpick too, as you would a cake to see if the inside is cooked and perhaps, switch the oven off and leave the loaf in for about 20 minutes. I use a small loaf tin – a 8 inch by 4 inch one. Hope it works out! Keep me posted! Thanks for your quick reply! So you use a small tin even when you double the recipe? In that case, do you still only bake it for 1½ hours? I am thinking that since a single recipe wasn’t completely cooked within 1hour and 20 minutes, a double would take almost 2 hours, no? Yes, the mixture does spill out a bit, but I like a high loaf. When I bake a batch of rolls, they take about 45-50 mins so this makes me suspect that oven temperatures do vary. Try yours for under 2 hours and see how it works. I guess the worse case is a crispy loaf?! Well, after many trials, I have finally found what works for me! Let me just say that the reason why it wasn’t working and that the bread was coming out sorta wet, is totally my fault! I thought I had purchased psyllium husk powder, but it was not powdered at all! It is already so small that it’s hard to tell! Anyway, after correcting that and slightly adjusting the recipe (I put 1¼ cup of almond meal and ¼ cup of flaxseed meal, I also double the recipe) and I can make a small miche (small round bread) and a few buns (6) and I find it turns out better than a loaf. I bake my buns for about 1:05 hours and the small miche for about 1:40 hours. Oh, and I also tried it in a bread maker but did not like the outcome. 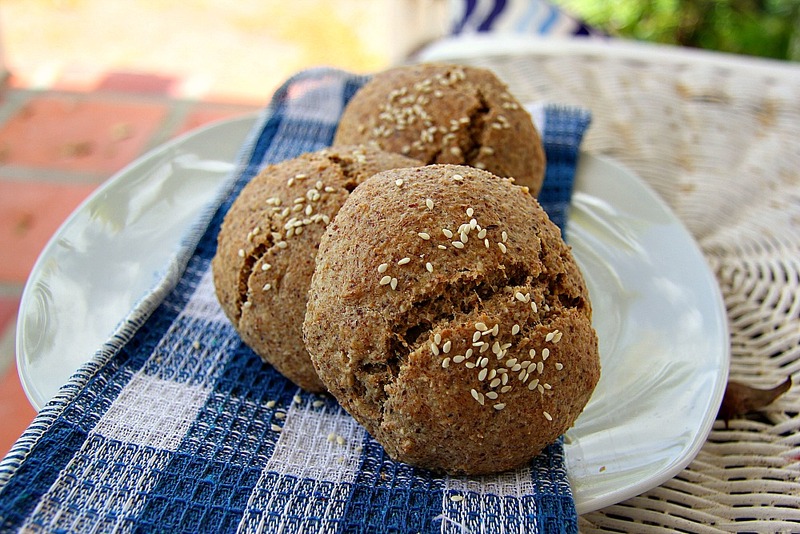 Hands down, best low-carb gluten-free bread recipe ever! Most bread recipes out there, give you a dense cake-like texture that I can’t stand for bread. This one is the closest to bread as far as texture, and is really easy to make and delicious! Thank you so much! Am delighted you got the recipe working for you! I also like the idea of adding flaxseed meal, will definitely try that! I love this recipe too (Maria, the creator of this is a food genius!). Thanks for stopping by the blog and enjoying the recipes. Funny, I actually thought of doing that as I was craving pizza! 🙂 I also thought that I could have toast with the flat bread! Will definitely do both! Will also try a pepperoni and cheese roll (similar to your artichoke picnic roll) So many possibilities! Having burgers with it tonight! Love love love! LOL! I’ve just done the same with a cinnamon muffin! Loving chocolate coconut pie though…*drools like Homer Simpsom*. Preheat oven to 350°F. Grease a 9″ pie plate. In a medium bowl, combine coconut, baking mix, sweetener equivalent to 3 tbsp of sugar, and the oil or butter and mix thoroughly. Press into the pie plate and bake 10 minutes or until the edges are lightly browned. Remove and cool. Meanwhile in a medium saucepan over medium-high heat, heat the coconut milk just until bibles begin to form. Remove from the heat, add chocolate, and stir until melted. Stir in vanilla, almond extract and the remaining sweetener equivalent to ½ cup sugar until blended. Pour into coconut shell, refrigerate until set. Yield: 8 servings, 453 cals, 7 g protein. 14 g carbs, 46 g fat, 36 g saturated fat, 8 g fiber. depending how sweet you want it, you may want more sugar. The tart with 8 oz of chocolate will be very rich and dense, like a truffle, if you prefer a more pudding-like texture, use less chocolate. Mix all and store in airtight container. I love this! Something to definitely try! Many, many thanks for this..! I will do! Can’t wait to try it! Hi Jenny, it’s 7/8 of a cup of water. Add it gradually is my tip, until the mixture looks like a dough. Hope it works out..let me know! Hi, just wanted to know which brand psyllium husk powder you use? I made some yesterday and although they tasted great they were a very dark in colour and purple inside! I’ve had that problem too. It’s mad how the brand of psyllium can make such a difference! I am currently using a brand called Konsyl which gives a better colour. Are you in the UK, if yes where do you get your psyllium from? I usually purchase mine from Amazon. When I saw this recipe I was skeptic as I tried a recipe for bread from another site that had flax meal as the predominant ingredient. While the loaf looked wonderful and had a beautiful bouncy and soft texture it was slimy (can’t think of a better word) I ended up throwing it away. I have these in the oven at the moment and they look just like buns. I will post what I think they taste like. It was weird making this because I couldn’t find psyllium husk powder, only the husk and when I added the boiling water it was just water and slowly it thickened and I could mould the buns. Fingers crossed… I’ll respond shortly! Oooh!Fingers crossed! You normally do need the husk powder to make these work. Perhaps grind the husk in a coffee grinder? I do hope this works out for you. It’s by far my favourite “bread” recipe and is amazing toasted too! (I double up the amount to make a small loaf at times). I do notice a difference in results depending upon the psyllium husk powder too…I had one that turned the inside purple! My husband has the same complaint about breads made with flax too. Let me know how your rolls went! Could you make it without the psyllium husk powder? Any substitutions? Thanks for this, they tasted great but were completely hollow in the middle, any suggestions would be greatly appreciated. Glad you enjoyed it…it could be that you overworked the dough a but more that you should. I’ve had this problem myself when I baked them with coconut flour. Gently stir the mixture and try again. Hope it works out! Finally a low carb alternative that doesn’t taste like scrambled egg or cardboard. YAY!! Glad you enjoy it Michelle! Everytime I bake these I feel like running out into the street and yelling with joy to passing strangers! They are just lovely toasted..had lovely scrambled eggs on toast this morning! Yum! Thanks for popping by! Wow, after 2-1/2 years of being gluten-free, these truly are the first rolls I’ve managed that actually have that “bready” texture!!! My fussy kids just ate them as hot dog buns and rated it two thumbs up. And very simple. I made the recipe into 6 small hot dog buns and had to reduce the baking time to 40 minutes — they were crispy on the outside and fluffy in the middle. Next time I’ll sprinkle some sesame seeds on top before baking.THANK YOU! PS: I just did the nutritional info and found that each roll (1/6 recipe) has 217 calories, 14g fat, 6g carbs, 3g fibre (so only 3g net carbs), and 6g protein. Healthy AND delicious!! So glad you enjoy them Louise. I went crazy with joy when I found this recipe…pure genious! Glad you enjoy them as much as I do Maxine! Thanks for popping by too! Hello, I am Brazilian and I loved your blog, I will make all the recipes without gluten and all look delicious, thanks for sharing, kisses. I made these on Tuesday. They are so good! I didn’t have the powder, I had the husks and a VitaMix, which made short work of turning them into a powder. I had bought the husks for a recipe that I never made, and was unable to get to the store, so I punted. It worked very well, but afterwards, I had a fine powder all over my countertops. It is much easier to buy the powder! Nonetheless, the recipe was easy to make and very bready, and my husband and I loved them. Thanks for sharing your recipes and expertise. I signed up for email updates because I really love your blog. Great recipes and a fun writing style can’t be beat. I made these plain for the first batch, but I am going to start experimenting with different flavors. I had a cold and couldn’t smell them, but my daughter could, and she groaned that she would be smelling them in the morning when she got up. She was right: these are better than an air freshened in a can. The house smelled wonderful all the next day. Awhh, shucks! Just glad you enjoy the recipes and stopped by! Thanks for this great recipe. My husband’s favourite thing on earth is bread, and since white bread is the devil, I am always looking for healthy, wheat and gluten free options! Loving your blog – just stumbled upon it today! Glad you stumbled by Sophia! Hope you enjoy the recipes and your husband enjoys the bread. Mine just loves this toasted with his eggs in the morning. (I double up the amount in the recipe and bake it in a small loaf tin). Great, thanks for the recipe! Hi wonderful Diva, Just made the rolls and, of course, could not wait to cut and eat a small piece. The inside is indeed “holey” , crust is crusty, but the color is much darker than your plain ones pictured here. I used my usual Honeyville blanched almond flour but the psyllium husk powder was quite brown and it made the batter brown (I used NOW brand, a reliable one). Any suggestions on making it more “white” like yours? Different psyllium brand, possibly? Also, do you think whisking the egg whites and adding them last might make for a fluffier vs. dense roll? Just thinking out loud. Regardless of appearance, the taste is very good. I’m a long-time LC person and bake quite a bit. This is probably the best LC bread recipe I’ve come across thus far. Love your blog and all you do to help the LC community, whatever our reasons for this WOE. Have just baked the rolls and they have turned out dark purple and quite hard so can you please tell me what I have done wrong? Hi Barbara! The purple colour will be due to the brand of pysllium powder. Try another brand and make sure that it is the powder, and not the husk. Happy cooking! Hope you enjoy them Sue! Aha! Just replied to your first question! Happy baking! I find this varies between brands of powder giving a purple colour. Try another brand. Hope they work out okay..let me know what you think of them. Glad you like them! I had some toasted today…really is like the real thing! And they kept me full for most of the day too! Another batch is in the oven! What is the reason for only using the egg white? The whole egg will give a heavier density but feel free to give it a try.